We were invited for dinner and surely, yours truly signs up for dessert. No surprise there. And as I scoured my bookmarks, looking for something simple and quick (after all, it's already noon and the dinner was at 6!) this Portuguese orange olive oil cake somehow looked very very promising. I've always been fascinated by olive oil cakes. Having made a few oil-based cakes before, I was looking forward to a tender crumbed tea cake, slightly fruit-fragrant, not just because of the orange, mind you, but the aromas emanating from the olive oil, and definitely something light and ethereal because it finally felt like spring. The cake was pretty easy to put together, although I can't say much about what happened to my arm after zesting 4 huge navel oranges after they have been soaked in boiling water to rid the skins of the wax. Slippery skins do not make for easy zesting. But hey, no pain no gain, right? And since I didn't have enough time to cool it completely, and had to transport it on the sky train, I so nonchalantly opened the cake carrier cover, treating every one in that car with delicious whiffs of my freshly baked orange olive oil cake. 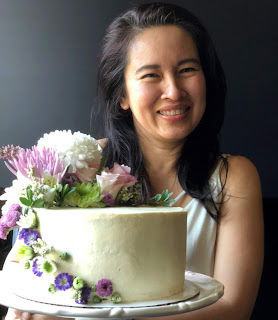 This recipe is perfect for a 22-inch springform pan, but the cake you see in the photos was made in a 24-inch silicone mold (for which I multiplied the recipe by 1.5 times, and allowed for more baking time). 1. Preheat your oven to 175C or 350F. 2. Butter and flour a 9 inch or 22 cm cake tin. Line the bottom with parchment paper. Skip this step if using a silicone mold, as I did. 3. In a medium bowl, whisk together the flour, almond flour, zest, baking powder and salt. Set this aside. 4. In a large bowl, beat together the eggs and sugar for 2 minutes until pale and frothy. 5. Add the honey and beat a further 2 minutes. 6. Beat in the evoo, vanilla extract, and the orange juice. 7. Transfer the dry ingredients into the wet ingredient bowl and mix until just combined. The batter will be quite runny. 8. Pour into the prepared cake tin and place in the oven. 9. Reduce the oven temperature to 160C or 325F and bake (preferably convection) for 60 minutes. Check doneness at the 50 minute mark. 10. Cool in the tin for 10 minutes, before inverting onto a cooling rack to cool completely. Dust with icing sugar when cooled, to serve.